Remember when Jocelyn suggested florals for Runway's April Issue in Devil Wears Prada, and Miranda Priestly roasted her with one of her many brilliant one-liners? "Florals? For Spring? Groundbreaking." Well, say goodbye to this stigma, because Rose Byrne looked amazing at the "Adult Beginners" premiere in a deep blue dress and electric blue pumps, giving the traditional floral look a new spin. Byrne stepped out in her indigo ensemble in Los Angeles at ArcLight Hollywood on Wednesday evening. The dress, which was from Christopher Kane's Fall 2015 collection, featured patches of what looks like velvet daisies connected together by sheer pieces, showing off some subtle skin. Trés chic! The dress ended mid-calf, and was belted at the waist. Byrne kept her makeup soft and simple, with a light red lip and fresh skin, and her hair was styled in soft waves. The gorgeous dress gave us some serious '70s Flower Power vibes, but was kept modern with the sheer aspect. And the color, typical for a fall or winter ensemble, was a surprising choice for a spring day, but of course, she looks incredible in it. To pull the look together, Byrne sported a burgundy nail color and a blue spiked statement ring. And pairing it all with those Brian Atwood shoes? Genius. 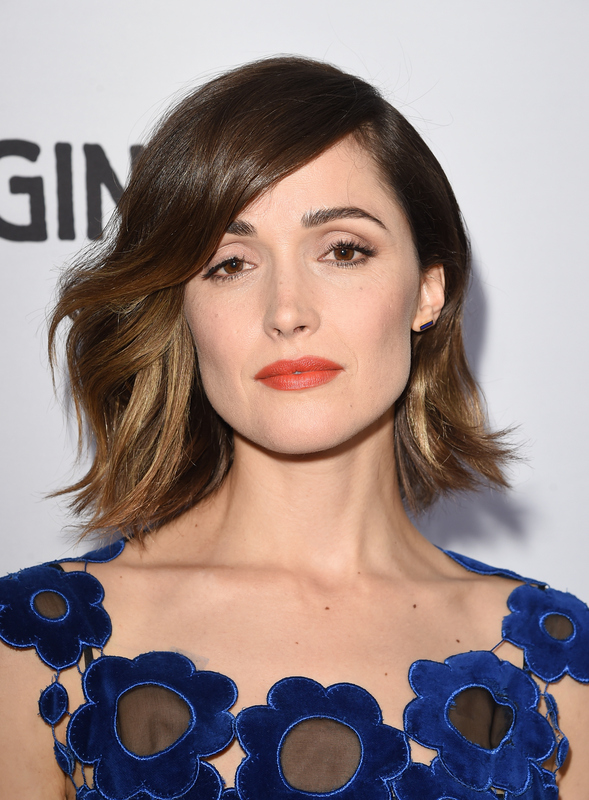 Rose Byrne has been on my fashion radar since I saw her in the white beaded jumpsuit at the SAG awards in 2012 with an Anna Wintour-esque bob. She is the princess of the long bob, and can make any frock look so chic, it hurts. I'm style crushin' hard.